Ferrari California T Interior, Sat Nav, Dashboard | What Car? 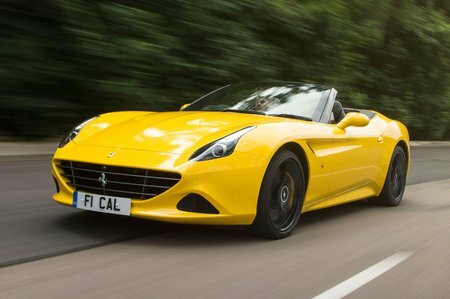 The California's strengths are low-set seats with a high-sided cockpit that encourages you to drive roof-down a lot of the time. The driving position is especially good, with the wheel (on which most frequently used switches are mounted) positioned unusually high in front of the driver. That layout makes the car feel very good over longer distances, and the cabin is quite well protected from wind buffeting, even at higher speeds. The doors are big, too, so access is easy. Thankfully, the California's infotainment system now features Apple CarPlay functionality, improving it no end. There's still a fairly unresponsive, low-resolution screen to put up with, but at least Apple's interface is far easier to read and use on the move.